FIGURE 2.8 Current velocity as a function of depth in an open channel. Mean velocity is obtained at a depth of 0.6 from the surface when depth is <0.75 m, and from the average of measurements at 0.2 and 0.8 depth in deeper rivers. at 0.1 depth intervals. In the absence of an appropriate current meter, floats give a rough measure of surface velocity, which when multiplied by 0.8-0.9 provides an estimate of mean velocity. Methods of discharge estimation are numerous, but the integration of point measurements of velocity and associated areas of flow is most common (Whiting 2003). Many rivers have permanent gauges consisting of a well on the stream bank, which is connected by a horizontal pipe to the deepest part of the channel to measure river height, or stage. Discharge is then estimated from Equation 2.3 for a range of flow conditions, and a stage-discharge rating curve is constructed for that location. Thereafter, discharge is estimated hourly or continuously by monitoring stage. Discharge varies over all timescales, from hourly and daily responses to a storm event, through seasonal, annual, and decadal intervals, as well as over historic and geologic time. 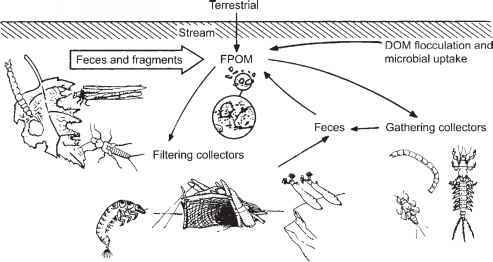 It usually increases along a stream network due to inputs from tributaries and groundwater. Over a stream reach of a few hundred meters, assuming that inputs from tributaries and groundwater are negligible, discharge should be the same at any of several transects, even though the channel shape and water velocity vary from transect to transect. This is known as the continuity relationship. A continuous record of discharge plotted against time is called a hydrograph. It can depict in detail the passage of a flood event over several days (Figure 2.9), or the discharge pattern over a year or more. A hydrograph has a number of characteristics that reflect the pathways and rapidity with which precipitation inputs reach the stream or river. Base flow represents groundwater input to river flow. Rainstorms result in increases above base flow, called stormflow or quickflow. The rising limb will be steepest when overland and shallow subsurface flows predominate, and more gradual when water reaches the stream through deeper pathways. 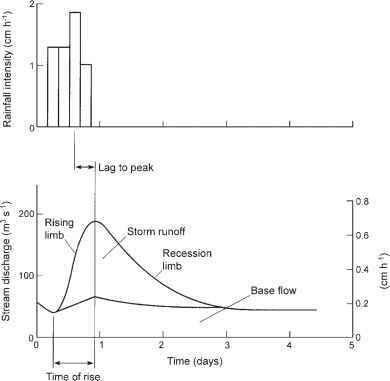 The magnitude of the hydrograph peak is influenced by the severity of the storm and the relative importance of various pathways by which rainwater enters the stream (Figure 2.5). The lag to peak measures the time between the center of mass of rainfall and the peak of the hydrograph. The recession limb describes the return to base flow conditions. enhanced by litter, other organic matter, and root structure, provides an infiltration capacity that rarely is exceeded in forested catchments of humid areas. Because flow is slower in subsurface pathways, this should result in a less pronounced rising limb of the hydrograph. Furthermore, the likelihood of sediment transport from the landscape is reduced, while the transport of dissolved materials is enhanced. Another general pattern is for flood hydro-graphs to become broader and less sharp as a river gathers tributaries in a downstream direction. This is due to differences among tributary subbasins in the amount and intensity of precipitation received, causing the sum of tributary inputs to a larger river to be less well defined than the individual events. In addition, a flood peak attenuates as it travels downstream owing to friction and temporary storage. This attenuation will be greatest when a river is connected to its floodplain and has natural bends and channel roughness. However, when a river is straightened and separated from its flood plain by levees, floods will pass very quickly downstream, where they may cause significant damage. The Upper Mississippi experienced a major flood in 1993 in response to a 1-in-200 year rainfall, with an orientation along the river channel that favored the convergence of flood waters, and that occurred during a period of above-normal soil moisture conditions and below-normal ET (Kunkel et al. 1994).